Today, the Tigers are continuing to revamp their team, this time signing free agent reliever Mark Lowe to a two-year deal worth $11 million. Lowe is coming off the best season his career and the Tigers will get the right-hander’s age 33 and 34 seasons. 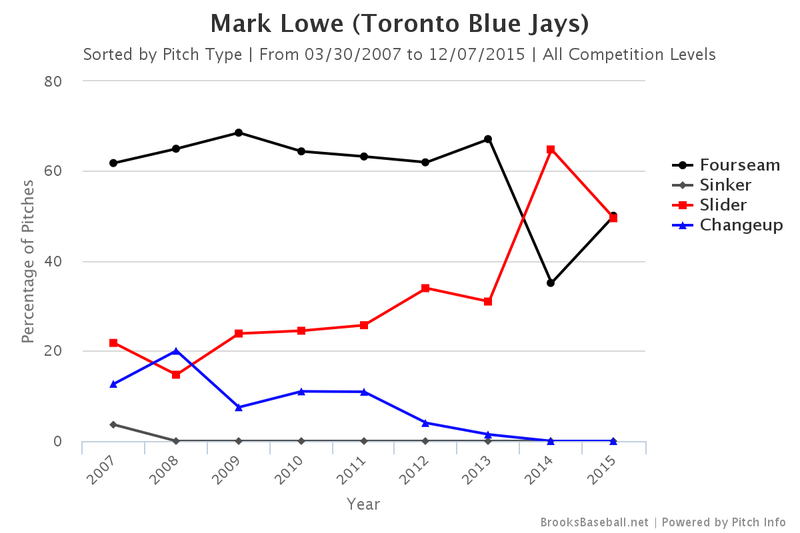 The simplest way to put it is that Lowe looked cooked entering 2015. He threw 18 terrible innings from 2013-2014 and had only been a mediocre reliever in 2011-2012. His only good season came all the way back in 2009, when he threw 80 innings of 76 ERA-/83 FIP- baseball in Seattle. The M’s re-signed him in 2015 as a reclamation project. He was reclaimed. A couple of key things happened. First, Lowe began relying on his slider more often. Try to ignore 2013 and 2014 in this graph because he hardly threw any innings, but if you track pre-2013 with 2015, the spike is clear. 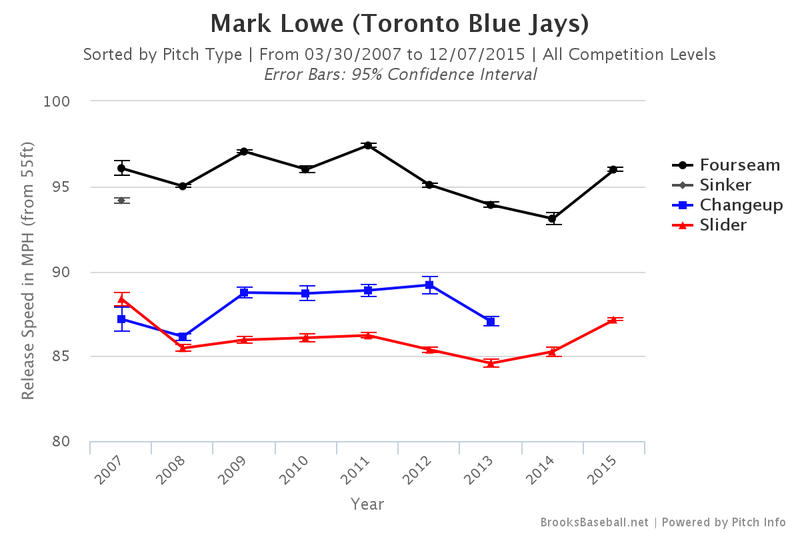 Essentially, Lowe stayed off the plate away against righties and lefties in 2015 more than he had in he past. And interestingly, he threw a lot of sliders to lefties and righties, when the typical RHP would typically use his slider more against right-handed batters. Lowe isn’t a sure thing by any means, but it’s fair to say that by throwing harder than he has in years and by mixing in more sliders with better command, his 2015 wasn’t a statistical fluke. He didn’t succeed in 2015 because he got lucky on balls in play or something like that. He pitched well, but when you’re talking about a guy with a long history of not pitching well, you always have to be cautious. Relievers are relievers. are betting on another elite season or anything. He’s getting paid like a second tier reliever in a year where lots of those guys are likely to get three years worth. Lowe is a nice guy to add to the bullpen along with K-Rod, but there’s still plenty of room for other arms if the Tigers can locate the money.